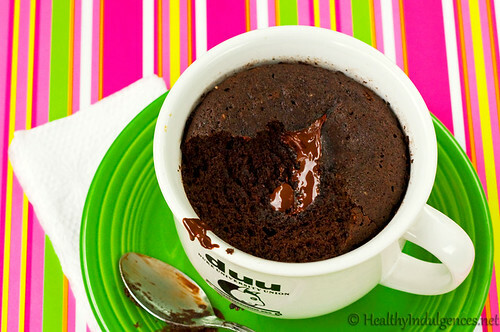 Here's my recipe for microwave chocolate cake - a decadent twist on the One Minute Muffin! More info and a giveaway at the post on my blog. **For a dairy-free/paleo version of this cake, use coconut oil or nonhydrogenated organic shortening and lite coconut milk. You can use a tablespoon of honey and the listed amount of stevia to sweeten it. Thanks for the recipe! I only eyeballed the sweetener, so mine wasn't sweet enough. But real quick to make, quick dish clean up. I didn't use bought almond flour... just used my coffee grinder and tossed in a handful of almonds, then sifted. Didn't have a way to make coconut flour, so I used a tad extra almond flour. So easy! I'd say to be sure to not over nuke this. I tossed it back in for another 20 seconds because it was wet on top. Turned out my chocolate chunk in the middle cooked, so no yummy gooeyness. Looks delicious, as always, Lauren. Any idea of the carb count?